The Indian Science Research Organisation launched the twenty first PSLV Thursday morning, carrying the RISAT-1 radar imaging satellite into low Earth orbit. Liftoff from the First Launch Pad at the Satish Dhawan Space Centre occurred on time at 00:17 UTC (05:47 local time). Radar Imaging Satellite 1, or RISAT-1, is the second satellite of India’s RISAT series. 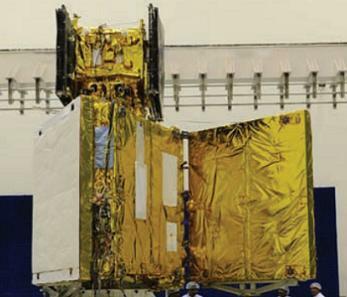 The smaller RISAT-2 satellite was launched in 2009, and is believed to incorporate Israeli technology. RISAT-1 is expected to carry an all-Indian radar imaging payload. The satellite has a mass at liftoff of 1,858 kilograms, making it the most massive spacecraft launched by a PSLV to date, and carries a c-band microwave synthetic aperture radar, operating on a frequency of 5.35 gigahertz. RISAT-1 is expected to operate in orbit for five years, making approximately fourteen orbits every day with a ground track which will repeat every 25 days. Its twin solar arrays are expected to provide around 2.2 kilowatts of power to the spacecraft’s systems; the spacecraft is also equipped with a 70 amp-hour nickel-hydrogen battery which the solar arrays will charge. Thursday’s launch marks the twenty first flight of the Polar Satellite Launch Vehicle, or PSLV, with vehicle C19 being used for the launch. The PSLV made its first flight in September 1993, carrying the IRS-1E satellite; however the launch ended in failure due to a guidance problem. The only other PSLV launch to have failed to date was the first operational launch, in September 1997, which placed the IRS-1D satellite into a lower orbit than planned. Although the satellite was able to reach a usable orbit, this was still somewhat lower than that the orbit for which it had been designed, and it expended more than seven tenths of its propellant in getting there. PSLV C19 was the third PSLV to fly in the PSLV-XL configuration; the most powerful version of the PSLV currently in service. The PSLV-XL made its first flight in November 2008, carrying the Chandrayaan-1 spacecraft bound for the Moon. A second flight was made in July 2011, with the GSAT-11 communications satellite, which was successfully injected into a geosynchronous transfer orbit. 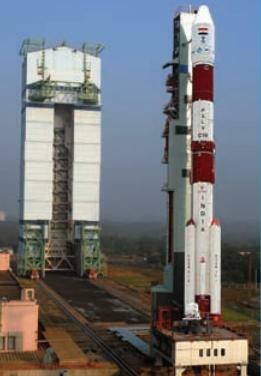 The PSLV-XL configuration consists of a standard PSLV core vehicle with enhanced boosters augmenting the first stage. The first stage of C19 was a PS1, with an S-138 solid motor delivering 4.8 meganewtons of thrust. It was augmented by six PS0M-XL solid rocket motors; four ground-lit and two air-lit, which each burned for a little less than fifty seconds. The second stage, a PS2, was powered by an L40 Vikas engine, burning unsymmetrical dimethylhydrazine and dinitrogen tetroxide; hypergolic propellants. The PSLV’s third stage was a solid-fuelled PS3, with an S-7 motor, and the fourth stage a PS4, powered by two L-2-5 engines burning monomethylhydrazine and mixed nitrogen oxides. The PS1 first stage ignited when the countdown reached zero, and the ground-lit boosters ignited 0.46 seconds afterwards, as PSLV C19 began its ascent towards orbit. Twenty five seconds after liftoff, the air-lit solids ignited, and 49.5 seconds into the flight the ground-lit motors burned out, separating 69.9 later. The air-lit motors would have burned out around 74.5 seconds after launch, and separated 92.0 seconds into the mission. The first stage had a stated burn time of 101.5 seconds, and separated from the second stage approximately 112.5 seconds into flight. Two tenths of a second after staging, the second stage’s engine ignited to begin an approximately 149-second burn. During the second stage burn, about forty seconds after ignition, the payload fairing separated. Around 266.0 seconds after liftoff, following the completion of its burn, the second stage separated, with the third stage igniting 1.1 seconds later. The third stage burn lasted 112.1 seconds, before the depletion of its solid propellant. Following third stage burnout, the third and fourth stages entered a coast phase to attain the proper altitude for the fourth stage burn. Towards the end of this coast phase, 512.8 seconds into the flight, the third stage was jettisoned. The fourth stage ignited to begin its burn about 11 seconds after separation, and burned for 510 seconds; just short of its maximum burn duration of 523 seconds. Cutoff occurred at 1,027.8 seconds into the mission, and was followed by the separation of RISAT-1 into its initial orbit, 1,064 seconds after liftoff. The target orbit for the launch was 480×480 km, inclined at 97.552 degrees to the equator, with error margins of 40.5 kilometres, and 0.2 degrees inclination; the rocket was reported to have reached a 470-476 by 479-482 kilometre orbit, well within these margins. RISAT-1 will subsequently manoeuvre into its operational sun-synchronous orbit, at an altitude of 536 kilometres. PSLV C19 launched from the First Launch Pad at the Satish Dhawan Space Centre (SDSC), a facility named after a former chairman of ISRO, who died in 2002. SDSC, previously known as Sriharikota, has been used for all Indian orbital launches. The First Launch Pad is mostly used for PSLV launches; like the Second Launch Pad, it can accommodate both the PSLV and the GSLV, however the GSLV flies mainly from the second pad whilst the PSLV regularly uses both. C19 was the fourteenth PSLV to launch from the pad, and the sixteenth rocket in total. The launch of PSLV C19 is the first Indian launch of 2012; a year in which India hopes to conduct the first successful flight test of its cryogenic upper stage, and fly a prototype of its heavy-lift GSLV Mk.III rocket. The next scheduled launch is expected to be of a PSLV with the SPOT-6 satellite in August, and this will be followed by a GSLV Mk.II which will attempt to orbit the GSAT-14 spacecraft using the new upper stage, which failed to ignite during its previous test flight in April 2010. Between the Mk.I, with a Russian upper stage, and the Mk.II with the Indian upper stage, the GSLV has achieved only two successful flights in seven attempts. That launch will be followed in December by a suborbital test flight of the GSLV Mk.III, flying without an upper stage to test its first stage and boosters. If this test is successful, the Mk.III could begin orbital launches in 2014. Another PSLV launch is also planned for the end of the year, carrying the SARAL satellite, and several secondary payloads.